The HotSpot works fine on the backend preview but not showing in the frontend? 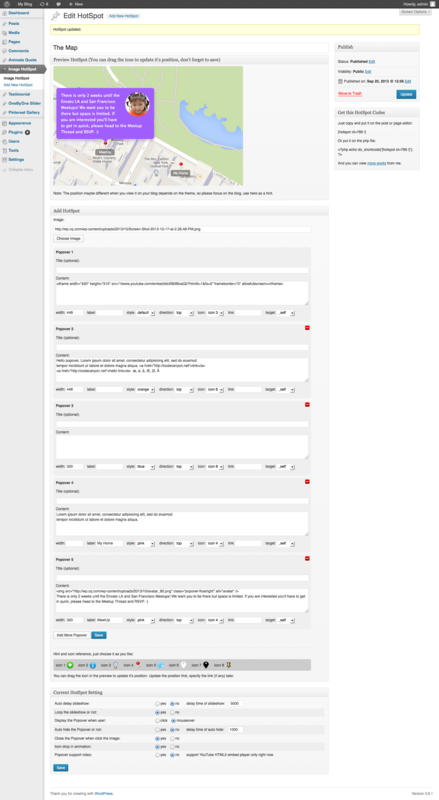 Some theme will add blank <p></p> to the content of the shortcode, this break the plugin. The raw tag will prevent it to add the unnecessary blank p tags. For the prior buyers, how to update? Just download the latest package from CodeCanyon, un-zip, upload and overwrite the files in your server, the data will be not lost with such update. - note: the data is different with prior version, so you have to re-add the content again if want to use the font icons. The data is safe with updating, you can still use the prior 1.2.6 too. - Fixed the large image is hidden in admin backend, now you can drag icons with large image. - Some other small improvement. - Add pulse border option for each pin, you can choose the pulse border (black/white) in the setting too. - Make the popup item in the backend sortable, you can drag them to re-order. It's useful if the popup is in slideshow mode. Update the pin position in responsive, make it more consistent and precise in small screen. - Add custom pin icon support, now you can add your own custom pin icon in the setting. - Different icon for hotspot in same image. 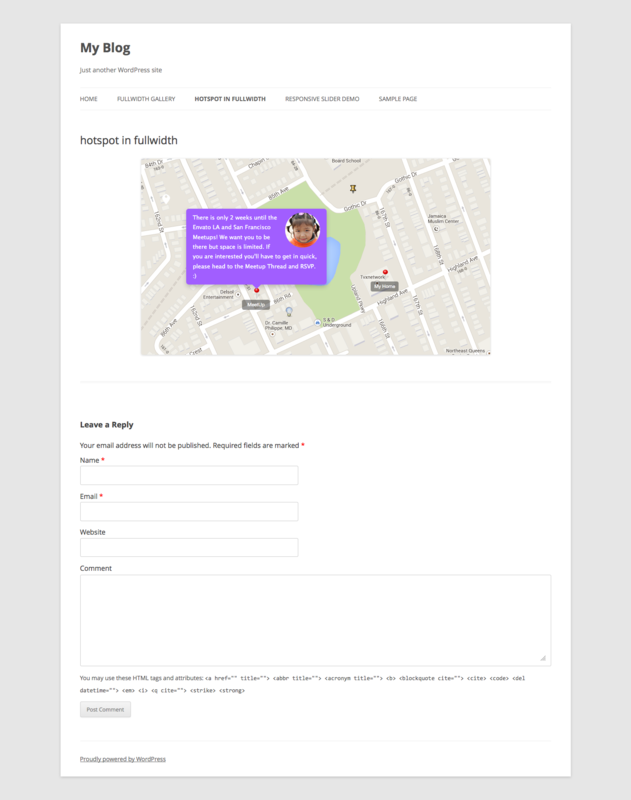 - Optional popover size, background and color. - Optional label under the icon. - Icon drop in animation. - Hyperlink with the icon. - Experiment YouTube video popover. 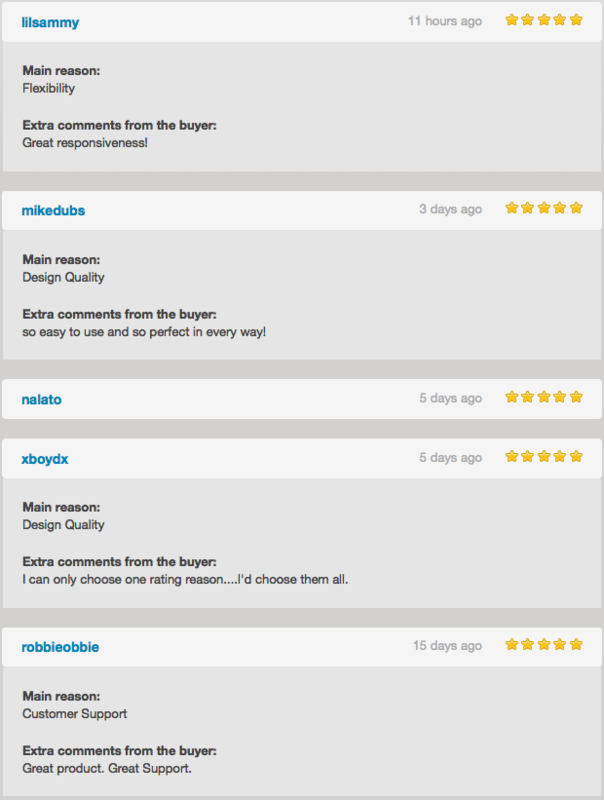 “Great plugin and I have been looking for something like this for years. “Congratulations on your fast respond to requests, great job!